When audiences see Rogue One: A Star Wars Story this month, they'll witness the culmination of more than 40 years of special-effects innovation from Industrial Light & Magic, the company founded by George Lucas just to fulfill the visual demands of his original 1977 blockbuster. Those X-Wing/TIE Fighter battles weren't shooting themselves, after all. Star Wars was only the beginning. Over seven installments, ILM turned to old-school processes and digital techniques, evolving all sides of the VFX business to ensure the franchise pushed the envelope every time. Here are five ways Lucas' elite team of visual-effects artists made the impossible possible for our current generation of blockbusters. Until Star Wars (1977), shots of ships in space were filmed with large- and small-scale models, allowing for slow and rigid movements. All that changed when Star Wars visual-effects supervisor John Dykstra devised a new computer-controlled motion camera system -- dubbed the the "Dykstraflex" -- for Star Wars. 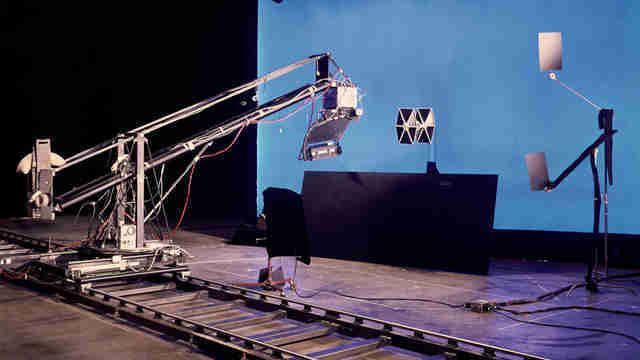 Now a spaceship model could be filmed against blue screen in a single position while the camera moved around it, the idea being to provide the illusion of movement. 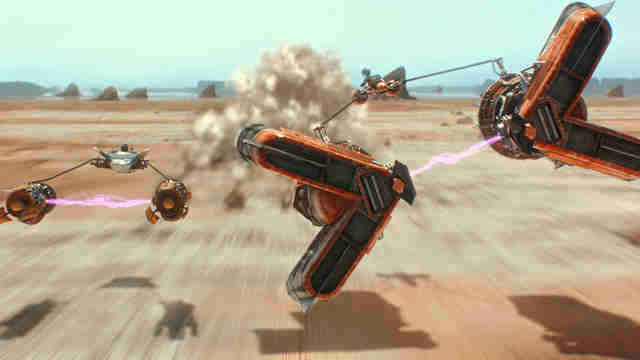 Other objects could then be filmed with the exact same camera move because the camera was all computer-controlled. When all these different elements were combined or "composited" together, it made it feel like one single dynamic shot. 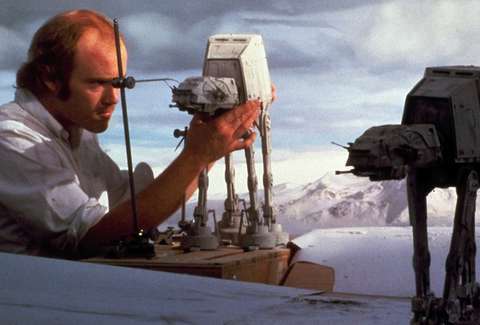 The Dykstraflex also enabled the stop-motion-animated AT-ATs and Tauntauns in The Empire Strikes Back (1981) to be composited into snow environments. 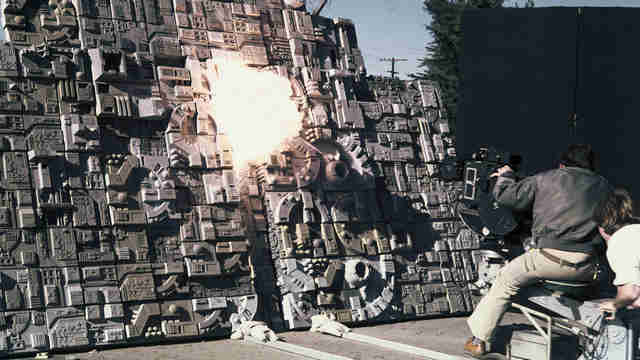 Similar techniques were used at ILM and elsewhere for scenes in the Indiana Jones franchise, Blade Runner, E.T., and Ghostbusters, among numerous other films. ILM developed the motion control especially for Star Wars, but the company also adopted and improved old technology to fit its needs. The first was the use of VistaVision cameras for visual-effects "plates," or the background images that replace blue screen. The VistaVision was an older breed of 35mm film camera in which the film ran horizontally instead of vertically through the camera gate. The result was a larger area of the film negative to capture miniatures and other elements on, creating crisper composites. The Death Star wasn't really floating out there in space -- many of the shots were captured in a parking lot -- but with integrating backgrounds shot on these camera rigs, viewers in 1977 needed a pause button to detect any trickery. ILM also looked to new ways to use camera technology for the thrilling speeder-bike chase on Endor in Return of the Jedi (1983). Here, instead of having to build an enormous miniature forest and film with motion-control cameras, ILM visual-effects supervisor Dennis Muren and Garrett Brown, inventor of the "Steadicam" gliding camera rig, trekked out to the redwood forest in California to capture background images. Muren and Brown would take a frame of the woods every few seconds. When that was run backwards at the normal 24 frames per second, it appeared to show the forest and trees zipping past. The characters could then be filmed against blue screen and composited in. Nowadays, swapping out blue screen with background plates is all done digitally. But for the original Star Wars trilogy, different elements were combined in an optical printer, where multiple projectors could transmit several different images onto a new piece of film to create a final shot. 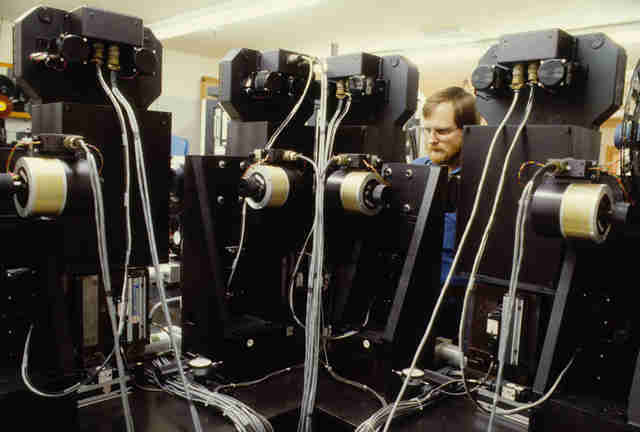 ILM's big development was a four-projector-head optical printer which improved precision and quality. That technology was still being used even on films like The Abyss (1989), where James Cameron used fledgling computer graphics to add 3D water forms to his filmed scenes. 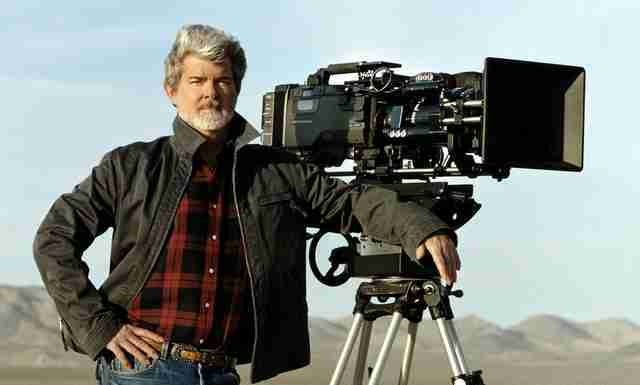 George Lucas notoriously hated shooting with film cameras and dealing with actual film. He adopted digital editing techniques early on, and pushed ILM to advance computer graphics technology. The company would test and abandon digital X-Wings in 1979, but would later develop the digital "Genesis Effect" sequences for 1982's Star Trek II: The Wrath of Khan and the first photorealistic CGI character for 1985's Young Sherlock Holmes. But it wasn't until Attack of the Clones (2002) that he was able to shoot an entire feature film fully on digital cameras. It would be only the third movie released to do so. Digital camerawork was embraced so hard by Hollywood, movies shot on film now use the fact as a selling point. Before Lucas digitally added and altered his original trilogy for the Special Edition releases, those films were generally devoid of computer graphics, save for a wire-frame holographic model of the Death Star under construction in Return of the Jedi (an effect achieved by the Lucasfilm Computer Division, which eventually became Pixar). But throughout the '90s, ILM had continued to evolve CG technology in movies like Terminator 2: Judgment Day and Jurassic Park. The results meant Lucas could embrace computer graphics in a big way for his prequel trilogy. The Phantom Menace (1999) became one of the first films with a fully digital main character: Jar Jar Binks -- a milestone of motion capture, CG animation and rendering at the time, and an endlessly lampooned addition to the Star Wars universe. Phantom Menace is full of other CG innovations. For the pod race, visual-effects supervisor John Knoll needed to depict a grand desert landscape but didn't feel ILM could build the entire environment in CG alone. Instead, artists took photographs of rock formations made as miniatures from multiple angles and then "re-projected" them onto low-resolution, geometrical shells based on the same formations. This "projection mapping" method let the camera move around as required and achieve a high level of believability. Think those original 1977 motion-controlled cameras, but with even less inhibited. 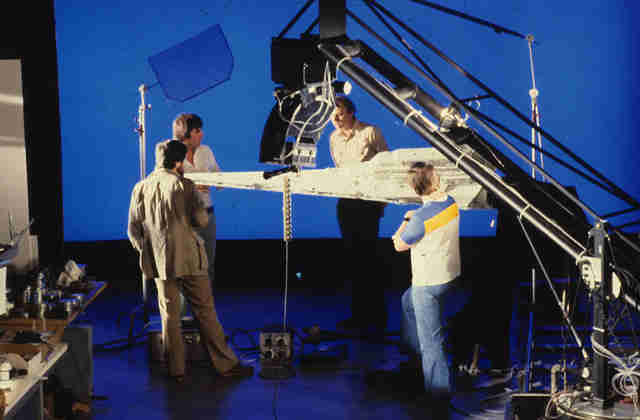 Star Wars films have changed filmmaking forever through the evolution of visual-effects production at ILM. Previously, some film studios had their own "special effects" departments, but ILM brought with it a close collective of artists, engineers, technicians, and production people dedicated to the craft. They paved the way for how effects pipelines on films would be orchestrated and, importantly, how visual-effects shots were budgeted. Over the past 40 years, too, the visual-effects industry has changed so quickly that an innovation one year might be a second-rate or even obsolete effect the next. Who knows how these next Star Wars films might change movies forever again.